I know it’s only June 5th but we already have insights for what happened with Smart Home providers last month. Yes, we have data that fast! And what we are seeing does not bode well for the “do it for me” market overall. Vivint remains on top with an impressive gain in engaged consumers over the April 2017 but still is lagging behind Comcast from a Net Promoter perspective. In fact Comcast saw a significant boost in NPS even as the number of engaged consumers dropped, an indication that while their signups might have slowed during the merry month of May, Xfinity has done a tremendous job delighting their customers over all other service providers. Alarm.com also so an increase in Net Promoter score over April 2017. Alarm is interesting in this mix as they are the platform independent Smart Home installers leverage to bring intelligence and security to their customer’s home. At some level, Alarm.com is a barometer for the long tail of professional installers. You can see they are out performing ADT, Cox Communications and even AT&T Digital Life. Could this mean that consumers are better served by independent Smart Home professionals? 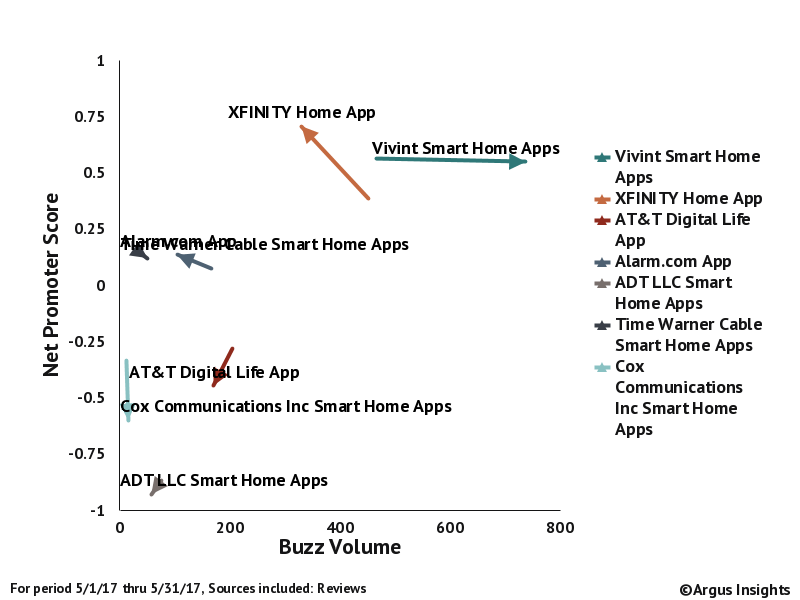 Time Warner, Vivint, and Cox Communications all saw increased engagement over April, typically correlated to an increase in overall subscribers (or a new version release). Everyone else saw a drop in engagement. Only Alarm and Xfinity saw those few customers happier with their overall service while ADT continues to languish in both engagement and Net Promoter Score. We have all the data and can help peek into the why behind the continued dominance of Vivint and Comcast or to understand what ADT needs to focus on to improve their UX. You can get the same evidence at your fingertips by signing up for a subscription to the Argus Analyzer. Find out more here.